Materials and Water Chemistry for Supercritical Water-cooled Reactors is unique in that it brings together materials and water chemistry, their interrelationship, the historical perspective and their application to SCWR conceptual design. Written by world’s leading experts, all active in the area of materials and chemistry R&D in support of GEN IV SCWR, this book presents for the first time a comprehensive reference on these topics, and in particular, how these data relate to the SCWR design itself. 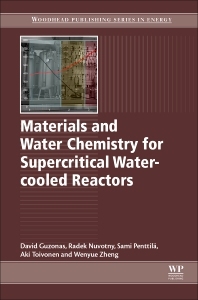 This book is an essential text for researchers in the areas of supercritical water-cooled reactor materials and chemistry, working in industry or academia. It will also give newcomers to the field a survey of all of the available literature and a clear understanding of how these studies relate to the design of the SCWR concept. The material presented is at a specialist’s level in materials or corrosion science, or in water chemistry of power plants. Graduated from Institute of Chemical Technology Prague, Department of Power Engineering, in 1996. He was granted his doctorate from the same department in 2000 after specializing in stress corrosion studies in high temperature water. He has been working in JRC IET since 2003. He is responsible for scientific activities of AMALIA laboratory with the main focus on material-coolant interaction under LWR and SCWR environmental conditions. He has participated in various nuclear reactor research projects at JRC IET since 2003. Graduated from Helsinki University of Technology in the Department of Process Control and Automation in 2006. Mr. Penttilä has worked at VTT Technical Research Centre of Finland in the area of corrosion monitoring in high temperature water conditions, focusing especially on supercritical water conditions. Mr. Penttilä has experience in national and international project management for several years. Mr. Penttilä has acted as a project manager (since 2009) in a national Gen IV network project (GEN4FIN). Currently Mr. Penttilä is the Euratom representative on the SCWR Materials and Chemistry PMB, and is currently the PMB chair. He has written over 40 reports and other publications related to Gen IV materials. Graduated from Helsinki University of Technology, Department of Mechanical Engineering, in 1994. He was granted his doctorate from the same department in 2005 after specializing in stress corrosion studies in high temperature water. He has participated in various nuclear reactor research topics at VTT since 1991 and acted as a project manager for numerous national and international nuclear power plant corrosion related projects since 1994.